The HP PhotoSmart Wireless CN245B is the entry-level model in the PhotoSmart range, yet comes with a whole set of features that belies its budget status. This all-in-one device comes with a colour LCD display on the screen, as well as full scanner, copy and print modes. It has a rather tall and boxy design, but with a front-loading in and out tray, it’s rather compact. HP has done away with physical buttons, opting for touch-sensitive buttons around the display. Below this you’ll find an SD Card slot for uploading your documents and pictures, which you can then edit and trim via the screen before directly printing. This printer comes with Wi-Fi built in and, along with installing the software and setting up the printer, you’ll find it takes over 45 minutes to be up and ready to print. Inserting the four cartridges is standard, but we like that the black is a high-capacity module. The rather large size of the printer allows for the A4 scanner, which is neatly concealed. We found scanning quality to be good and on a par with the Epson Stylus SX425W. When it comes to printing, you’ll find this quite a loud machine. However, the results are spectacular, with colour prints being rich and vibrant. Equally, mono text is crisp and sharp with plenty of depth to the black. Cartridge replacements work out the most economical, with a four-pack costing around £22 (inc. VAT), while individual colours can be bought for just £7 (inc. VAT). The high-capacity black cartridge is more expensive, but even at £13 (inc. VAT) it represents great value for money. 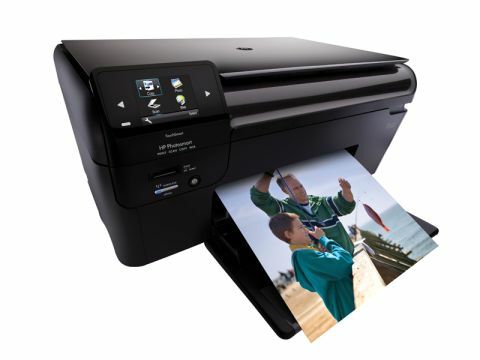 The HP PhotoSmart Wireless CN245B is a loud and rather slow printer, but the results are well worth waiting for. With highly economical running costs, this all-in-one certainly gives the Epson a run for its money.